Choice is is the keyword. It is one of the most critical components to successful public space. While site furniture options like benches and seat walls are inflexible and less useful than tables and chairs. While they do provide seating, they offer significantly less options for users when they are the dominant seating choice. Their arrangement represents how the designer anticipated the users needs and how they may use the furniture. There is little if any room for these decision to be easily and cost-effectively changed in the future. Too often this inflexibility, diminishes a place’s potential and misses a large segment of users whose needs are not met. Like in the cafe, tables and chairs make easier to eat your lunch, work, hold a meeting with colleagues, rest a coffee while you read, or simply to have a conversation. Making tables and chairs movable further increases their advantage by giving the user the ability to adapt the space to their needs. All in all they are an empowering amenity that lifts the burden off of the designer to anticipate exactly how the space will be used. This is important because too often users surprise designers with the unexpected. While the revered insights from Jane Jacobs, William H. Whyte, Jan Gehl and other luminaries about how to activate public space are engrained in the urban design professional’s collective knowledge base, implementation of these lessons and principles related to seating and choice have not always translated in the physical manifestations of their designs. These shortcomings haven’t happened for lack of trying but have been greatly influenced by the cultural attitude toward the public realm, real estate trends, fear, as well as budgetary constraints. Over the last thirty years the public’s appreciation and expectations for more agile and multi-functional spaces and the impact they have on the future of our cities and quality life has shifted tremendously. This shift has followed closely with the rise of urban living as more people embrace denser cities and expect higher quality amenities outside their door. 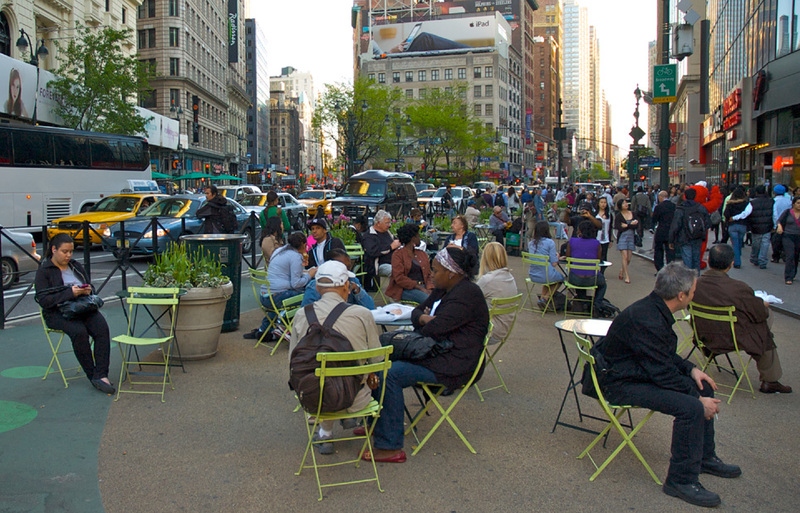 Cities have responded by investing in public space to attract and retain talent and in turn invigorate their economy. The quality of the public realm has benefited from this. This demand for greater public space has translated into movable tables and chairs becoming a more common amenity within high profile spaces. STAFFING. One of the most common management practices, particularly in well funded urban spaces, is to utilize staff for daily security and management of the public space. This typically includes employees being responsible for moving furniture in and out of storage every morning and evening or locking it up when the public space is closed. Obviously, this limits the hours the space can be used and adds an extra burden and expense on the operations of the space. Columbus Commons in Columbus, OH is an example of this management model. MEMO OF UNDERSTANDING (MOU). Another strategy similar to staffing, particularly in streetscape settings, is to shift the management role to the adjacent property owners/businesses to manage and replace the furniture in front of their establishments. This is often done by establishing a MOU with the parties involved. This can also be done with neighborhood community groups. The recent improvements along Broadway in Los Angeles are an example of this strategy being put into practice. SOCIAL DECORUM. In some instances owners rely solely on the social decorum of civil society to not damage or steal the chairs. They simply leave them outside. They have decided the risk of losing chairs to theft or vandalism cost less to replace than providing staffing and security to manage them. This strategy typically works better in locations that are more active and under passive surveillance by the public. In order to reduce risk, this strategy is often combined with design strategies such as branding furniture, using less expensive furniture, and/or in some cases using heavier furniture. The 34th Street Partnership in New York City exemplifies this strategy. TETHERING. In other cases, management and designers has resorted to fixing the table to the pavement and tethering chairs to the table. While tethering does allow for some movement and protection from theft, it does not promote the rearrangement of the furniture and greatly compromises the benefits of movable tables and chairs. Unfortunately, many spaces decide to use fixed furniture or none at all because they lack the resources to implement these strategies or are too risk averse to want to try. The result being a significant reduction in the space’s potential to contribute to a vibrant and useful public realm. We are all too often left with banal and less activated urban environments. Our communities are poorer for it. In an effort to provide additional options that expand the opportunities and context where movable tables and chairs can be used, the AGILE Landscape Project is exploring new ways to activate the public realm by providing options that secure tables and chairs in a way that still allows them to be arranged in a multitude of configurations with far less maintenance and management. The patent pending technology employed by TALP’s CHAIR>bench project is a first step in achieving this. With all of these strategies and the continued increase in demand/value for great places that bring communities together, the future of public space is expected to get more useful, flexible, and movable. Just maybe the fixed furniture’s stranglehold on public space will be broken and movable will be the de facto choice of the twenty-first century and beyond. The success of our public spaces depend on it. This entry was posted in Movable Site Furniture and tagged Business Improvement District, chair, Landscape Architecture, Movable Chair, site furniture, table, Urban Design. Bookmark the permalink. ← Enlightened Space: Will LED Lighting Be The Backbone of the Smart City? Thanks for the comment and glad the post was of interest. Getting movable furniture in public space is a constant struggle.